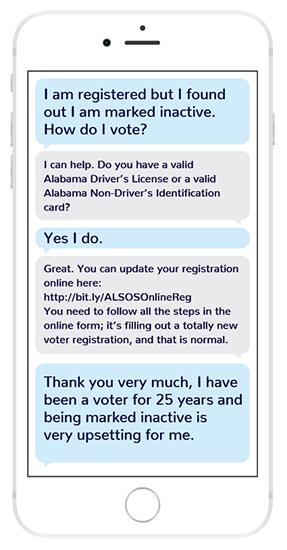 Open Progress is applying its winning techniques and technology to the upcoming December 12th Special Election for the US Senate in Alabama. Supporting voter registration is a top priority of Open Progress, which seeks to minimize the influence of money in government and politics. Expanding the electorate and helping all voters vote is a key plank of how Open Progress believes the corrupting power of money can be offset in the United States. Open Progress and a team of 800+ volunteers are donating their time and energy to reach out via text message to all voters marked inactive so that their registration information can be updated and their status changed to active prior to the December 12th special election. All of the funding behind Open Progress’ Alabama outreach program is donated, with the average donation being $25. Open Progress knows the power of person-to-person texting, as volunteers in the Open Progress and OPro LLC Text Troop sent over 1.2 million text messages in support of 51 Virginia House of Delegates candidates as well as Mark Herring for Attorney General this year.